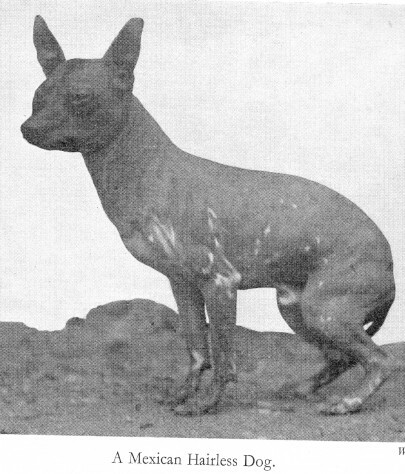 This hairless dog was a rare hairless breed from Africa. Its actual origins are unclear as it had a number of other names. 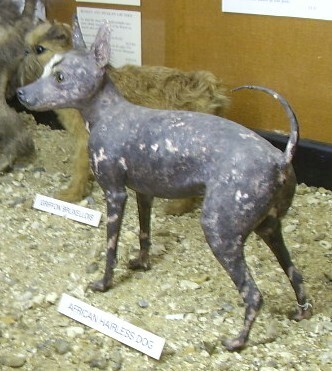 African Hairless Dog: a rare hairless breed from Africa. 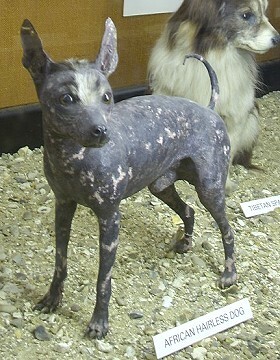 Hairless Dogs or Naked Dogs occasionally reappear in Zoological Gardens and in the kennels of cynological collectors, but are not well known generally. The dogs vary from the completely naked type to one with a tuft of hair on the head, shoulders, or tail and feet. They have never ‘caught on’ as a fancy, and it is very doubtful if they ever will, owing to their general repulsiveness and rather delicate physiques. Generally they are degenerate, with poor constitutions and unsound dentition. There exist many types, the principal of which is the Mexican Hairless Dog, which is recognised by the American Kennel Club and classified as a Toy Dog. This type is supported in a small way and exhibited from time to time. The earliest and most typical specimens to have been imported into Britain were those owned by Mr. H. C. Brooke who was never really happy unless he had a full kennel of some or other exotic breed. Its colour is usually pink, light slate blue, dark slate, black, or mottled. In build it is generally light in bone and roach-backed, something like an Italian Greyhound. Height is about 11 inches and weight about 10 pounds. At one time it was used for food. The African Hairless Dog, or Abyssinian Sand Dog as it is sometimes called, is a more cloddy type, not so well known. A specimen has been in the London Zoological Gardens and attracted some attention [now a taxidermy exhibit at the Zoological Museum in Tring], but the breed has never appealed to British dog lovers. This type may be of the general colour scheme (the same as the Mexican type) with the addition of pink with black blotches or a dun shade. Many of this type are unable to bark until kennelled with normal dogs and taught the art. China has a weird variety known as the Chinese Crested Dog or Chinese Hairless Dog. This is a taller race than the Mexican and is conspicuous by having a tuft or top-knot of silky hair on the crown of the head. Sometimes it sports a similar tuft on the tip of the tail as well. Mr. W. K. Taunton had several dogs of this breed in England in the 1880s when they connived towards a limited notoriety with the same lack of success as the other varieties of the family. The Chinese Crested Dog stands about i6 inches in height and weighs some 20-25 pounds. Build is rather racy with a short back and gay tail. Colours are of the same range, with the white or pink background with black spots or blotches being most common. The Egyptian Hairless Dog is little known. Apart from the fact that one died in the London Zoological Gardens in 1833, there is no information available on specimens which have been imported from Egypt. It appears, however, to be an even more degenerate type than the other naked dogs. In the Dublin Edition of the Encyclopaedia Britannica published in 1791 the group is referred to as having’ lost their hair by heat of climate’, and of the group the Turkish Naked Dog is chosen as representative. This is a type much like the Italian Greyhound, with a short muzzle and domed skull, and is very little known in Britain although one or two specimens seem to have been imported at times. This last-named is usually coloured dun or fawn and is not mottled or pied. The group generally is inactive, and is usually rather short-lived in British climates.